Ahhh! as I take a deep breath and try to uncover what is lurking below my consciousness. I know that i hold onto my persona very tightly. But mostly what comes to me from your blog is that spirit of delight with magical moments and the fact that each moment can be magical if we wish it to be. For me, I want to save the magic for special moments so it won’t become commonplace. Then, when I get really bad news, I can pull up the magical moment at will. So that’s my way and I’m sticking to it. Peter, really enjoyed the wonderment you found. With a snorkel you have to stay on the surface though you can look beneath and make short dives. Now put some tanks on and dive for an extended period; the world will really change. I went ocean diving in my teens in the Atlantic off the coast of New England. Bursky, I think, is still ocean diving in the Pacific (or was until not long ago). He’s done night dives where it’s like being on a different planet. I just sent you a note inquiring about the availability of your book – The Book of Light. I then noticed your blog. 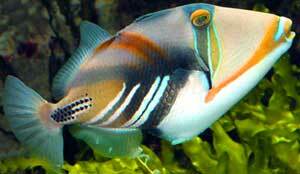 I was so pleased to see a triggerfish ! Perhaps a humuhumunukunukuapua’a ? One of our great loves in life is traveling to Maui and snorkeling 2 or 3 times a day. Talk about Light. The colors of the local fish lit up by the warm Maui sunshine is a wonderful thing indeed. One of life’s great experiences. Quick story; we have been to Maui quite a few times. One of our earliest visits was with our three children when they were young (now all grown up). Our youngest at the time (around 8) was not keen on the snorkel gear, but joined us with a life belt and his swim goggles. As we swam in the Honokeana Cove (our fav place to stay) I felt a tug from him. I worried he might want to return to shore. Instead, I pulled my head up and he pointed ahead with eyes nearly coming out of their sockets at a beautiful green sea turtle floating a few feet in front of us. We hadn’t seen it, but because he was spending more time on the surface he did. I will never forget the sense of wonder and awe in his young face.